Here’s a special occasion vegan dish. It’s very easy to make and has a somewhat “cheesy” quality from the nutritional yeast. Yum! In a small skillet or saucepan, heat the olive oil (or vegetable stock) over medium heat. Add minced garlic and sauté until garlic is fragrant and translucent (do not brown). Whisk in the flour and miso and add the bay leaf. Continue cooking for 1 minute. Very slowly whisk in the vegetable broth followed by the soy or almond milk. Add the nutritional yeast, mustard, and white wine vinegar. Whisk vigorously to combine. Cook for another 5 minutes, whisking often. Remove the bay leaf. Spray a 9” x 13” casserole with vegetable spray (I tried lining it with parchment paper—total fail—everything stuck). Spread half of the sliced potatoes in an even layer. Season with salt and pepper. Spread the sliced onion over the potatoes. Pour half the white sauce over the onions. Sprinkle with fresh thyme leaves and pepper. Follow with the remaining sliced potatoes, once again seasoning with salt and pepper. Sprinkle with more fresh thyme leaves. Pour the remaining white sauce over the gratin. 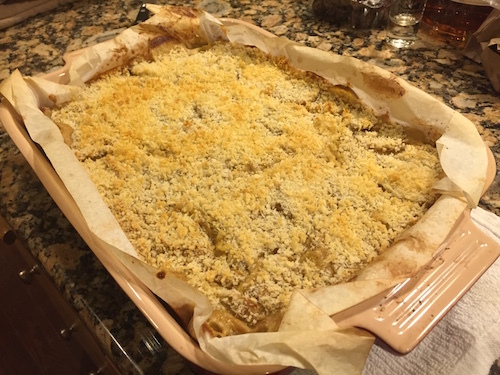 Top with panko bread crumbs. Uncover and bake for another 30 minutes. Let sit for 10 minutes before serving. Garnish with freshly chopped parsley. Tip: For best results and quicker preparation, use a food processor to slice the potatoes. Watch out for your fingers, that blade is wicked. This entry was posted in Pasta, Potato & Substitutions, Vegan, Vegetables on December 27, 2017 by Blackberry Season.